Just recently DJI has sent out an invitation to media and press members for an event called "Because life is big", which will take place on November 28th at the Good Morning America Studios in Midtown Manhattan, New York. Like in the past, DJI uses these kind of events to showcase their latest. DJI was set to announce the new Mavic 2 on July 18th, but the ‘See The Bigger Picture’ event was unexpectedly postponed, because the company wanted to ensure that they can exceed customers’ expectations for our technology by the time of the event, so the drone has yet to be officially unveiled. But. 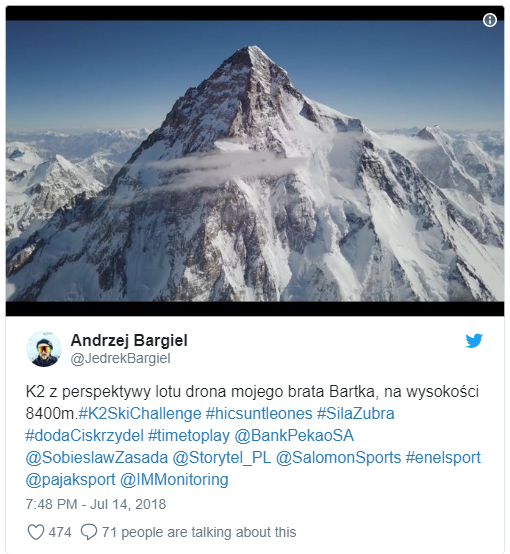 Drones are commonly used during rescue operations, However, no one suspected that they will be able to find a missing person at a height of over 8000 m. As it turns out, it is possible. Rick Allen, one of the world`s best known mountaineers, went missing on 9th July 2018 during summit attempt on Broad Peak,. "RONIN-S - Dare to Move" is the theme of the new camera stabilizer by DJI. On the 29th of May DJI finally released price and availability of the new stabilizer. The first delivery will supposedly be at the end of June/beginning of July. Designed for DSLR and mirrorless cameras, the Ronin-S combines. On the 8th of May 2018 DJI released a new drone which will extend the Phantom series: The Phantom 4 Pro V2.0. The new Phantom 4 Pro V2.0 features an OcuSync HD transmission system, which supports automatic dual-frequency band switching and connects to DJI Goggles RE wirelessly. Like The Phantom 4 Pro.